This paragraph, from USA Today’s editorial “Trump is unfit for the presidency,” is not an outlier. It reflects yet another oddity of the 2016 election cycle: The unprecedented shunning of a major-party nominee by nearly every widely read daily publication in the country. Of the top 100 daily newspapers ranked by 2016 circulation, 55 have endorsed Hillary Clinton.1 Only one, the Las Vegas Review-Journal, has endorsed Donald Trump. For many newspapers, this hardly comes as a surprise; The New York Times, for instance, has endorsed a Democrat in every presidential race since 1960. But for others, a Clinton endorsement is truly off-brand. Six major papers — The Dallas Morning News, Arizona Republic, San Diego Union-Tribune, Columbus Dispatch, Omaha World-Herald, and Cincinnati Enquirer — are each breaking a streak of Republican endorsements going back 32 years or more to choose Clinton. Other reliably conservative editorial boards are instead siding with Libertarian Gary Johnson, or simply refusing to pick a candidate. And USA Today, the highest-circulation daily newspaper in the country, is stepping into the endorsement game for the first time with the “anti-endorsement” of Trump quoted above. Just how ahistorical is this? I used historical endorsement data since 1980 compiled by the data journalist Noah Veltman to quantify a sort of “surprise factor” for newspaper endorsements. For each paper, I calculated an “expected endorsement” ranging from 0 (definitely the Democrat) to 1 (definitely the Republican) based on that paper’s endorsement record, weighted toward recent elections.2 Given that we have a two-party system, I counted any third-party endorsement or non-endorsement as a 0.5, and any anti-endorsement as an endorsement of the opponent (though not every editorial board would agree with that interpretation). And even this is being a bit unfair to Clinton. Barack Obama in 2008 was the second-most “over-endorsed” candidate in the data set, making 2008 and 2012 among the most left-leaning endorsement years on record. So (because of the weighting method) Clinton had a high expectation bar to clear — and she cleared it by an unprecedented margin. On the other hand, the data shows a leftward trend in newspaper endorsements since the Reagan era, so it’s possible that our expectation hasn’t caught up sufficiently. He has an astonishing lack of knowledge about the world and about how government works. Worse, he shows no curiosity to learn. His stunning refusal Wednesday night to say he will accept the results of the election undermines one of the hallmarks of our democracy. And he has no peer in his ability to spout untruths. If that weren’t enough, his temperament disqualifies him. He wants to be president like it’s a trophy to be won, and he would have others do the actual work. That is not leadership. So perhaps Clinton’s unparalleled landslide in newspaper endorsements is reflective not of ideological bias, but of general agreement among journalists — conservative as well as liberal — as to the qualities that make a candidate fit or unfit for the presidency. Of course, this explanation offers little consolation to those Trump supporters who feel the news media is rigged against them. From the outside, consensus and conspiracy look awfully similar. This information from this source, the American Presidency Project at the University of California, Santa Barbara, differs slightly from the historical data compiled by the data journalist Noah Veltman and used for the remainder of this piece, as it was updated more recently. The two sources also disagree on circulation estimates; nine papers on each source’s top-100 list are missing from the other (the sources agree in every case where they overlap). Using Veltman’s data, Clinton’s count is 49 while Trump’s is still one. I used a rule-of-thumb technique called exponential smoothing, which predicts the next value in a sequence based on previously observed values. 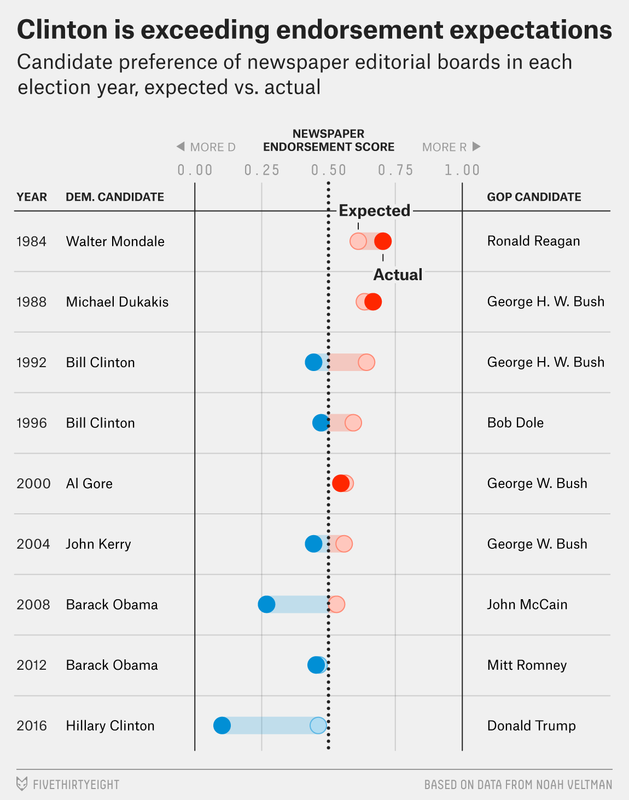 In particular, each election’s expected endorsement is a weighted average of the previous election’s expected endorsement (defined recursively) and the previous election’s actual endorsement. The weight was chosen to minimize the observed error for 2012. Remember, we’re counting Johnson/None endorsements as half an endorsement each for Clinton and Trump. Among just the two-party endorsements, she’s at 98 percent. Additionally, almost all newspaper or magazine editorial boards in the U.S. are independent of their news-gathering operations, but Trump’s critique does not make that distinction.